What is this rush about - was my question. It's about grabbing one of the last HMTs. During my evening walk last week in Connaught Place, I found an unusual rush in one of the stores in Middle Circle which made me curious as I had not seen such enthusiasm for this brand offlate. It was an HMT watch store. The rush there was of watch collectors who were queuing up at the store to get a part of history as the government decides to finally draw the curtains for this watch manufacturer. It indeed was sad to see how such a company which once enjoyed complete monopoly over the watch market is now going down for want of customers. Till 1991, with over 90% market share for three decades, HMT watches were truly 'Desh ki Dhadkan', as was their punchline. However, as the liberalization set foot in India and more companies gained access, HMT found itself lagging. Marred by lack of foresight, agility and sense of customer the company did not adapt to the changing customer preferences in time. My dad had a hexagonal dialed HMT for quite long and he used to wear it with pride every day. When I gifted him a sparkling swiss made ticker, he did move onto it to honor the gift, but still would go back to his old possession at times. In their prime, HMT watches were infact owned with pride and were most sought after gifts. It is said that not only top Indian politicians were fans of these, but so were the rich from across the borders as far as Russia who loved to grab these. It was a cherished status symbol which was acceptable as dowry gift. These watches were famed to be more rugged than any of the alternatives and fables have that these were even preferred to some extent even in the home of watches – Switzerland as they would not even lose time in harshest of winters. As with most of the government undertaking, the company enjoyed rich talent pool and its engineers were one of the best in the country. With time and courtesy to almost monopoly over market it had developed good technology, retail network, servicing and distribution. Such was the caliber that it was the first company to develop quartz watch in India. All that the company needed was to change with time and align its product with changing customer requirement. This was where it failed. 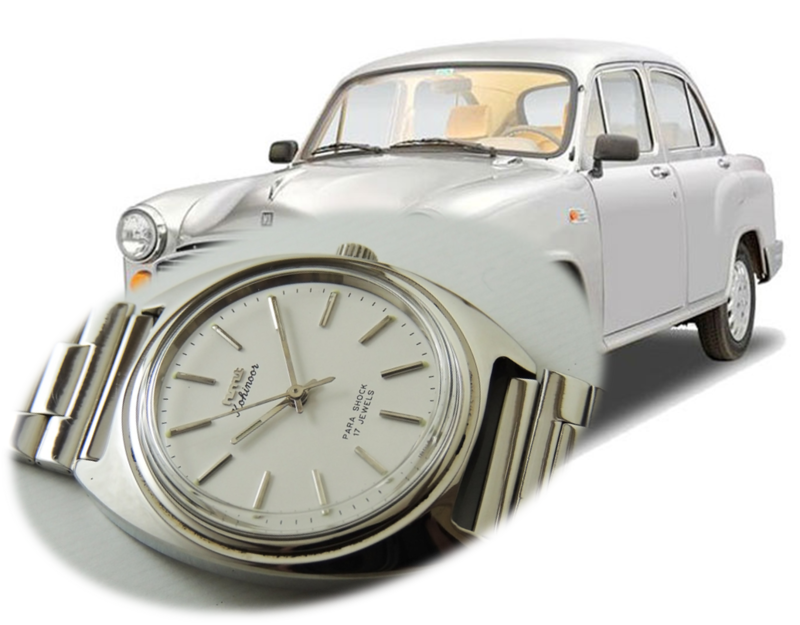 Theses watches were introduced in 1961s in collaboration with Japan's company Citizen and were manufactured by Hindustan Machine Tools. In 1970s, when HMT first introduced the quartz watch, it was much ahead of the time and hence HMT had to move its focus back to the mechanical watches. But in 1980s as market adopted quartz timepieces, HMT still increased its investment in manufacturing units of mechanical watches. This was where they started their downward journey. As mechanical watches went out of fashion, they had increasing production facility lying idle and losses kept mounting. Slowly but steadily the company kept under-performing and is finally seeing the end of daylight today with only interest in the left over pieces as collectibles. The story is very similar to what happened with the good old Amby – Hindustan Motor's Ambassador. This symbol of power and elitism ended its successful run after seven decades of sales when it winded up its operations recently. When the Ambassador car was first introduced in 1957 in a newly independent India, the car was considered to be the height of style and status. It was the car of choice for bureaucrats and politicians and its possession implied status in those times. It gradually became more of a symbol of simplicity and its use limited to a few old-age politicians apart from taxis in some part of the country. The downfall continued and that icon of the Indian road has now reached the end of the path after losing its dominance because of changing consumer tastes, an opening marketplace for automobiles and fierce competition. Though even in its dying days, the car enjoyed sales higher than some of its contemporary competitors. However, for a company which has a single car in its brochure finally could not sustain the falling sales and succumbed to time. In all the cars I have had an opportunity to be in; I really believe that this stunner on the roads had one of the most comfortable ride. Soon these too would only be available as heritage collectibles as would the HMTs. These two brands are testimonies of how government apathy and laggard management of public companies could ruin the name and capability of a wonderful product. While wrapping up this thought, all I can wish is that had their management were a bit proactive in their approach to incorporate the cosmetic preferences of the we could have enjoyed these fantastically engineered products for long. * Hindustan Motors hardly any noticeable changes since they started manufacturing of Ambassador cars based on British Morris Oxford. They literally failed to do any innovation. The features and functionality at times called nice to have or even no one has thought of it, has slowly become basic requirement of the consumers. They had to open eyes at least after Maruti came to India and when it started to getting popular. They forgot principal of survival of the fittest. * Same has happened with HMT watch. After arrival mobile phone, the need of the wrist watched was almost over. But many continued to buy it as fashion statement, jewelry and for utility. I think about Casio here. There was no need of digital watch at all, but they came with G-shock model and it was good sport utility and many used it as fashion statement also. I also bought one G-sock which I wear only while swimming to count the laps. The Swiss watches also bought by many for style statement and to show wealth. If I understood correctly, they were ahead in technology at one point compared to their Swiss peers, they might have failed to file right patent and lost huge possible royalty and marketing opportunity. If I'd be heading HMT today, few months back we would have launched world class digital and rugged watch which connects the smart phone and do many of the computing tasks with it. It would keep track of you, your heart beat and blood pressure etc while sport, exercise and swimming etc. It would be following your commend via voice and gesture also and it would act as nondetachable companion. What I think is company like HM and HMT, started because of dream of passionate people in the government and bureaucracy. They also removed all possible hurdle and started the best. But over the period of the time, next generation of politicians and Babus lost interest in that. Probably there were more interested in the corruption. They also failed to attract right talent possibly because of reservation of cast in the government recruitment. When you are in market with cut throat competition, you can't afford to have people who hardly got pass class in the exams and probably who were not fit to enter the engineering college. Specially when government opened the market in 1991, they should have taken care or coping up their companies with the global market but they failed because of lack of vision and interest. Because of current political scenario in India (Changed recently but it will take of time to remove all mud from the system) it makes sense that government focus just on governance and let people and private companies take care of the #MakeInIndia mission. If government sets right policies for the people who could innovate (but doing business is complex problem for them), very soon India will compete in the global market. In US major defense projects including research and development is done by private companies and that competing environment delivers better and faster result. Hope the new model in India will help to accelerate the manufacturing which is efficient and ahead in the market segment. Hey Jatin, Thanks for the kind words for the blog and also for the effort for such an awesome analysis. The points you have put down aptly hit right on the nail. The ones superior products simply could't keep up to requirement of time. While they had the best quality (and in some ways still do) they should have taken the customer aspiration in mind too. I recently drove ambassador and it still has a very robust drive. Wish it could have kept the other equipment at par with competition. Anyways I should say that your views definitely add a lot of value to my post and would really make a good extended reading to the blog post. Thanks again for contributing ! !